I'm no audiophile but I do appreciate high quality sound. I can't count how many different amps, speakers, and headphones I've purchased over the past 20 years. It seems like I'm always searching for something just a little bit better. Finally though, after years of searching, I feel like I've found the best audio setup for the money. When searching for speakers for your office you might be tempted to simply search for "computer speakers." This will bring up thousands of small, self-powered speakers. Some of them may even come with a subwoofer. 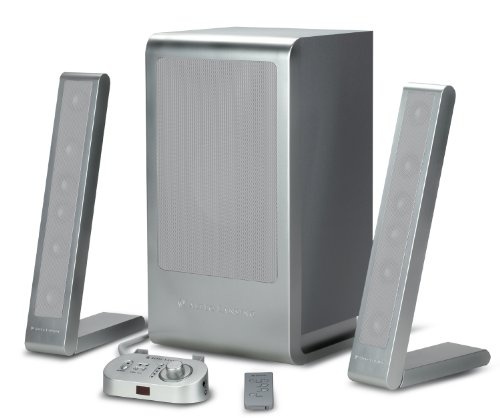 Perhaps the most impressive "computer speakers" I've heard are the Bose Companion 5 Multimedia Speakers. For their size, the sound they produce at medium volume is pretty incredible. The problem is that they are $400 and they tend to change the sound in certain cases to keep from distorting at higher volumes. 99% of users would never have an issue with these speakers but for $400, we could build something much nicer. I personally own many different brands of speakers but I continue to find that my favorite (affordable) audio brand is Polk. I've found that for the money, nothing beats them, at least nothing that I have tried so far. Because of that I've built 3 audio setups that revolve around Polk speakers. Each setup will allow you to upgrade components later as your budget expands or you become more interested in audio. This is a great place to start with a lot of room to upgrade. You're starting with decent quality bookshelf speakers and an extremely cheap amplifier to push them. You could easily add a subwoofer to this system or upgrade your amp when you get more cash without any guilt. If you can't afford a subwoofer right now, this is setup I would suggest. You're buying high quality Polk speakers that you will probably keep for the rest of your life and you have a solid Sony amp that is powerful enough to push much larger speakers if you upgrade one day. If you ever decide to buy a subwoofer, this setup won't require any other upgrades. There is no doubt that you could spend more money and get higher quality sound but I believe that after this price point speakers, amps, and subs get exponentially more expensive without getting exponentially better. This $350 system seems to be the ultimate "bang for your buck." Of course I am not claiming to have tried every amp and speaker ever made. I am simply sharing the knowledge that I have gained from years of searching for high quality, yet affordable audio gear. Hopefully this will at the very least steer you away from those "all in one" sound systems. If you buy each piece separately and you'll have much more control, higher quality sound, and hopefully, if you can control yourself, you'll save money as well. Can You Use a Sound Bar for Computer Speakers? You completely missed the greatest deal in audio components: Orb Audio speakers and amplifiers. They sound incredible, made completely in America, and will beat the systems you had discussed in this article. Amazon now carries them, but I recommend going to the actual site for better package deals. I have 3 sets of them, include a set up attached to my computer. Paired with an Echo Dot.... awesomeness. I'm beginning to realize after having this video and post up only for a few minutes that I am going to start an audio war. I've never heard of Orb audio but the premise seems very similar to Bose; take the mids out of the main speakers and add them to the sub to save space. I like Bose. I own many of their products. But I can't imagine that these little speakers can out perform a full sized speaker. Bose is incredible for the size but not the best option when size isn't a factor. 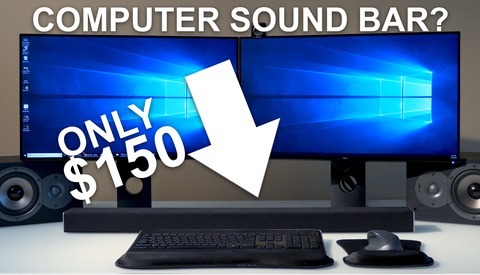 You did a great job on the video - I think you have guided any viewer towards a fantastic system in the $400 range and your encouragement to stay away from "computer speakers" is spot on. I love Polk speakers also, and use them in my home theatre set up. However your premise was "Best Computer Speakers...." Many folks would never be able to or want to use such large components at their desks. My suggestion - the better Orb amp, two of their orb speakers, and either their small or large sub. You are right that the conceptual set up is similar to Bose but you will notice a significant difference if you A/B them. I actually don't like the sound of Bose speakers - oddly they sound muted and drab to me. But Orb speakers have a much fuller sound. Somehow they are executing the concept better. From a physical space perspective, the Orb speakers sit nicely on the desk or as a companion to a TV. The Orb amp is similar to the ones you are showing, but better input/output options and the sub is on the floor, under the desk and out of the way. Much better in a situation where you cannot integrate the very large components you include in your system. In a editing studio, yes, your system would make a lot of sense. I think my suggestion is better where space is an issue. Similar cost. Audio people are more opinionated than camera people... watch out! Good video for me though. I use Adam F5s at home and they're pretty snazzy. I started out with Fostex PM0.4 which were also pretty snazzy for the price point and quality-to-size. So in a piece about the best computer speakers, you recommend avoiding computer speakers? Lee, what you reviewed are not computer speakers, they're "desktop" or "bookshelf" speakers. 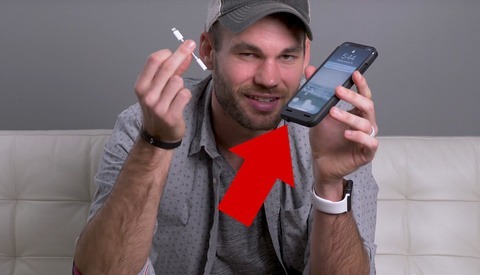 No Polk coupon code after the plug? Just kidding. First, when talking about the Polk RTI A3, I think that you was trying to say they have a wider soundstage. Basically, it's speakers ability to reproduce the recording's width (left and right) and depth (front to back). Additionally, I'd like to throw the Elac Debut B6 in the the mix. This would make for a $450 setup with the other components laid out there, but there speakers have been reviewed by multiple sources as the best for the money at $230/pair. Finally, if someone is looking for a more convenient option for their computer, I'd say it's worth looking at the KRK Rokit 5 active speakers for $300/pair. Yes, they are powered, but they're a reference monitor so they create a relatively flat response curve for a more realistic sound reproduction. They're also more than loud enough for the average sized office or bedroom. I've had a pair of these for about 6 years and they are still going strong. I was thinking the exact same thing - lets see some reference monitors on here. The KRK stuff is great! Polk has an annual Black Friday sale with a ridiculous 50% off deal. It's the only way I could afford their LSiM 707s. If you can, wait till next year. Be sure to sign up for their newsletter to get first dibs, as the inventory doesn't last very long once the word is out. These speakers are pretty incredible for the price and their size. If you don't care about volume they are a great choice. I'm interested why you guys have gone down the route of using speakers for sound rather than headphones? Is everyone's desk in it's own separate office? Well this is actually something we were joking about yesterday. 3 of the computers are in offices and 3 are in one big room. We have this setup even in the large room for each computers but 90% of the time headphones are used. I personally prefer speakers to headphones but I have my own office so it isn't an issue. When I use the other computers I'll use the speakers only when the office is empty. Great review though! I might have to have a listen to your suggestions, see how they compare. Thanks. THE BEST CAMERA EVER (at any budget). I am no photographer but I do appreciate a nice image. 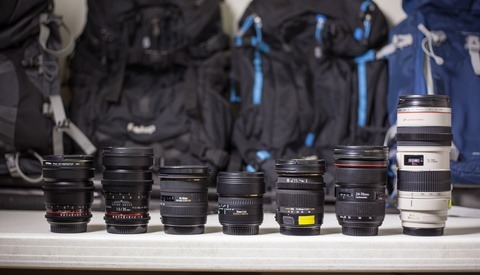 Now I will tell you what you have to have in your camera bag. After years of searching I have a gut feeling that I found the perfect camera for the money, although I am not a photographer and I actually don't know much about photography. I own a lot of camera but keep finding my favorite is the Pork TSi100 (i mean, in comparison with my other cheap camera), nothing beats it, at least nothing that I have tried so far. There is no doubt that you could spend more money and get higher quality images but I believe that after this price point camera, lenses, memory cards get exponentially more expensive without getting exponentially better. This $350 system seems to be the ultimate "bang for your buck." Hopefully this will at the very least steer you away from those "all in one" camera. Of course I am not claiming to have tried every camera and lenses ever made. I am simply sharing the knowledge that I have gained from years of searching for high quality, yet affordable gear. Am I the only one to see the Irony ? I would argue that there are also cameras that are the very best value for the money and at a certain price point diminishing returns start creeping in. Thx for the info...I personally think the Sonos and Logitech lines of speakers are far better and in some cases, less expensive. Happy to see another Polk fan! Wife just for me a pair of LSiM 707s as an early holiday gift. God, do they sound epic! Not exactly suited for computer use though. For computer use, my LSiM 703s are just stellar. Need a good amp for both though. Amp is everything. Man you are tempting me Michael. I have the Tsi500s as my mains but those 707s look awesome! If I ever move into a nicer house with a dedicated AV closet I might have to upgrade and get a dedicated theater amp to run everything. The 707s have dual woofers (each) that render the need for a separate subwoofer unnecessary. And their ring radiator tweeters just replicate the higher tones in a way traditional tweeters can't. If you can find them used, or wait for Polk's annual Black Friday sale, they'll make you a happy listener for life. They weigh 130lbs each, and the enclosures are so deep I can no longer lower my projector screen. Wish I could comment on the Klipsch. But it's like shooting with a Nikon. Never had a reason to try any other brand after my first pair of Polks in 1994. They were delivered just two weeks ago. Unpacking them was like unwrapping pallets of cinder blocks. As a previous recording studio owner, I only allow Genelec to treat my ears in the house / office. Now they're a decent computer audio speaker...! Never heared of Polk. Do they sell their speakers in Europe as well? Love the ESI Unik 05 for editing. Fun post! 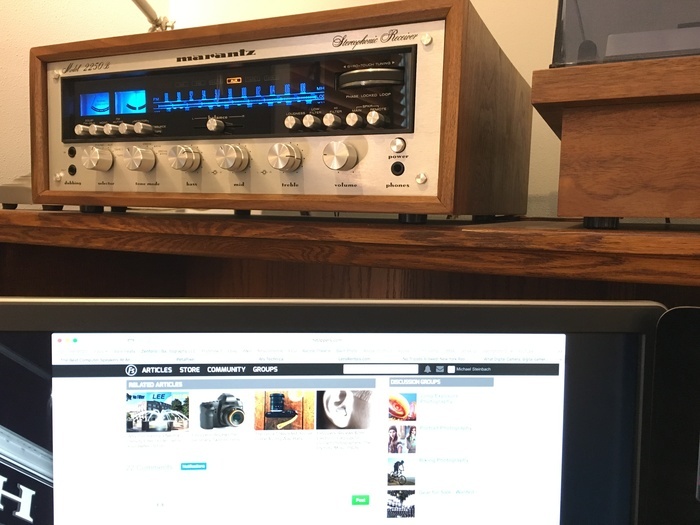 The best sound for me is through my 40 year old Marantz and 35 year old pair of JBL L110. Like cameras, to each their own!